Sewage Pumping Station in 3 inch pump station The FS Mini is suitable for pumping sewage for a single dwelling Also suitable for pumping rainwater, comes in 1000mmDia. Sewage Pumping Station in 3 inch pump station suitable for all applications, domestic for foul, sewage pumping. 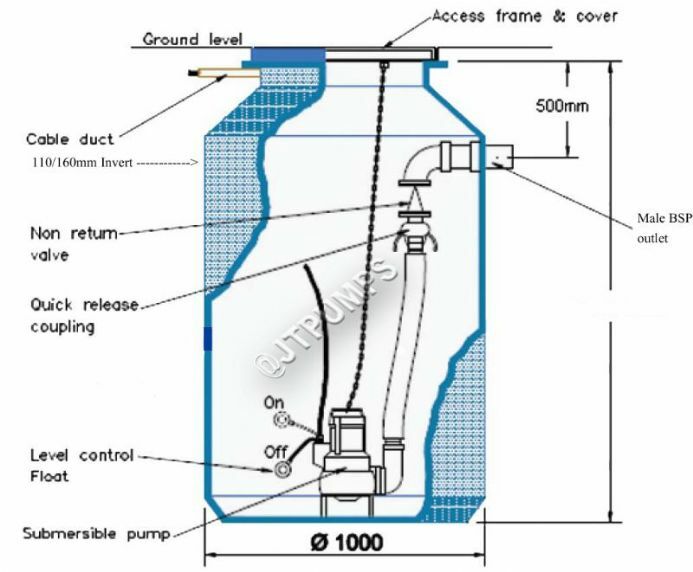 Single dwellings Also suitable for pumping rainwater. The JTFS Mini is a pre-assembled ready for use pump station particularly suitable when the water from drains is collected at lower than the main sewer. Absolutely bang on, does what it says on the tin – and that goes for both the pump and the contractors! Turned up on time, happy to explain anything I needed to know, i installed the pump with no fuss, and it works a treat. What more can a guy ask for? A great reliable pump, I needed something that could handle large volumes consistently and this is ideal. Great service too – I know I can be a bit of an awkward customer sometimes but I really can’t fault them.